It’s sure been a while since I’ve blogged–As always, time sure flies. It’s not that I haven’t been cooking anything new for the past year. Unfortunately, I just haven’t had the time to document it! Bad excuse. But here’s my attempt to start it up again. :) This is my first post of this year… WOOT! 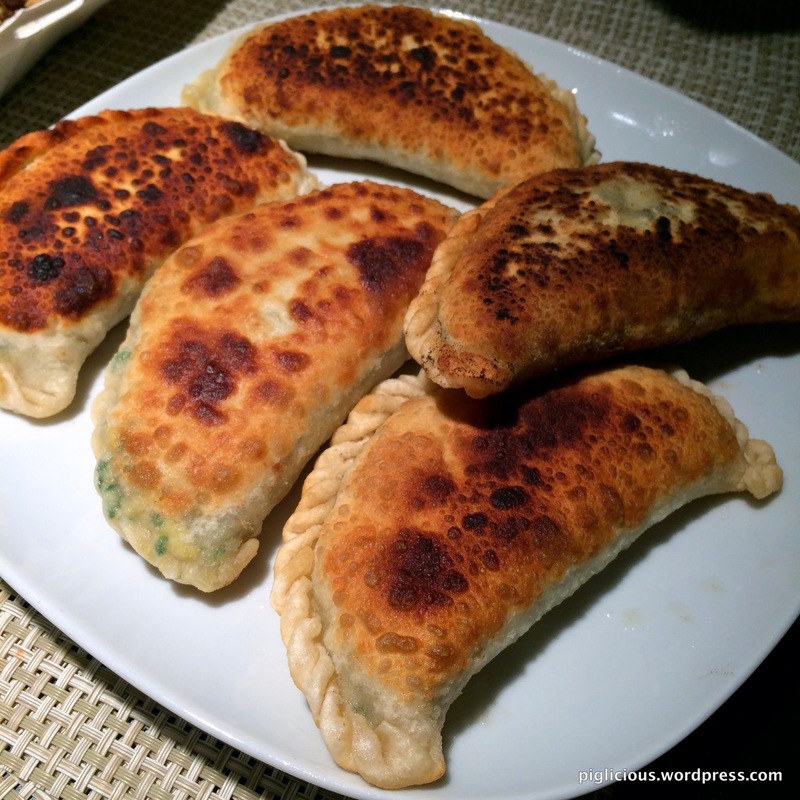 So for the past few months, I had been obsessing over some delicious chive boxes at a nearby restaurant. They kind of reminded me of the ones my mother used to make, and naturally I wanted to learn to make them myself! I’ve made these a couple of times now and have concluded that this following recipe was closest to the taste of how I remember it to be. If you have a chance to make it, I hope you will enjoy it too! Before you start anything else, soak the bean thread in water. For the mixer, add more cold water as needed and mix on low. If using your hand, add cold water as needed and continue kneading the dough. Continue mixing and adding water as needed until all the flour sticks together in a mound. The mound should be not too hard and not too sticky. 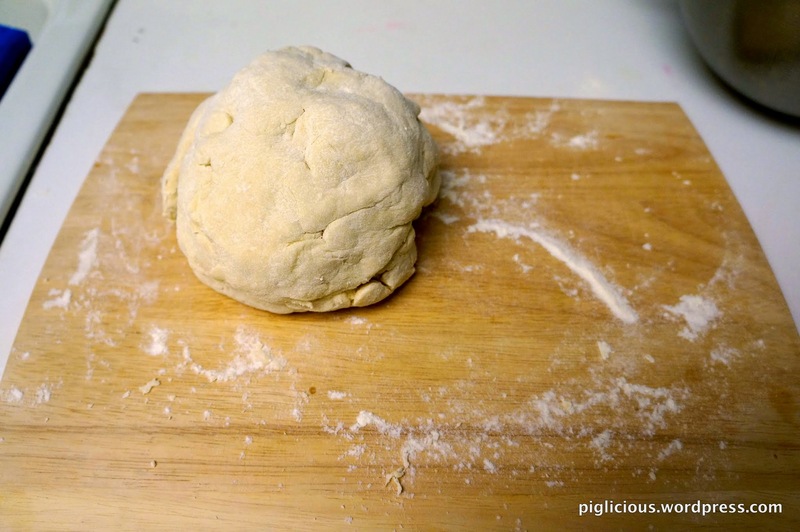 Take the dough out of the mixer and continue kneading it with a lil bit of flour. If you’re already hand kneading it, continue with a lil bit more flour. Eventually make the dough into a ball. 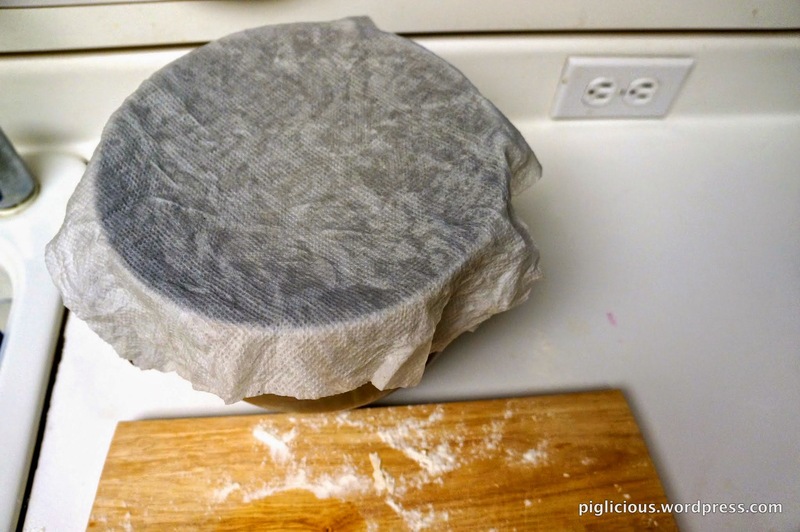 Place it in a mixing bowl or bowl and cover it with a wet paper towel. 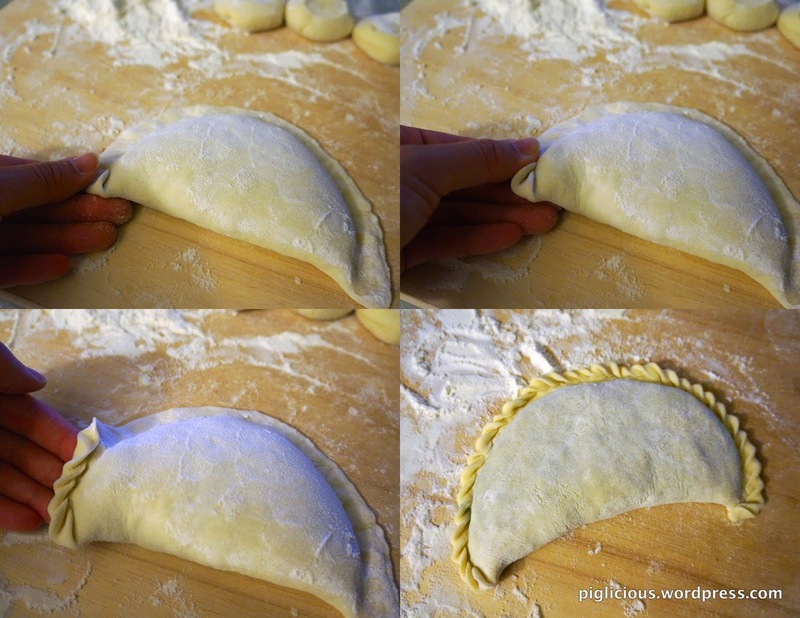 This will let the dough settle while you prepare the filling. 2) Make the filling. 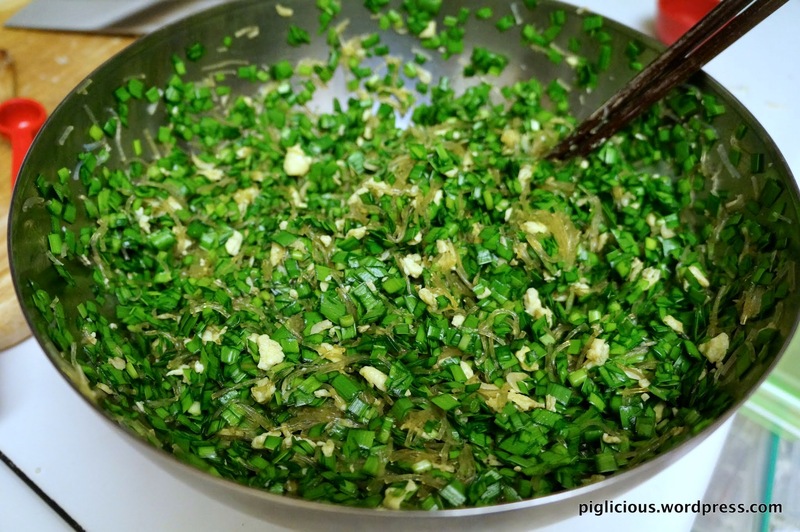 Take the chives and cut off about 1 inch of the stems. 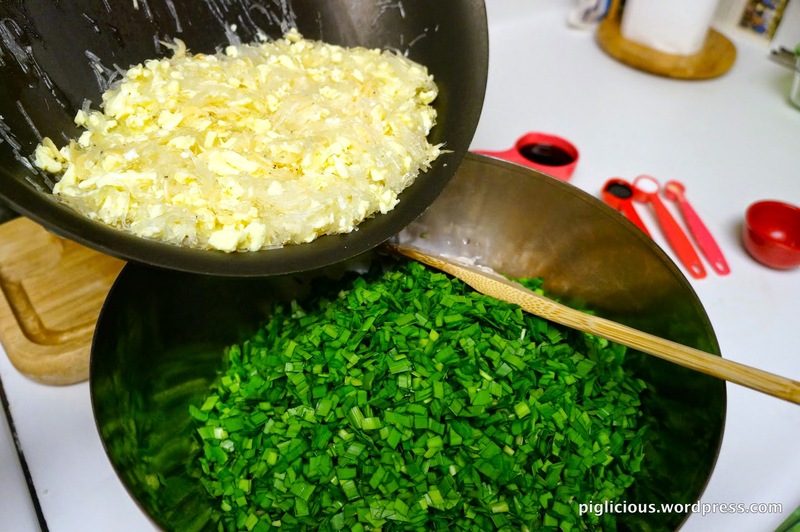 Wash and chop the chives into small pieces. The bean thread should be softened by now. Discard the bean thread water and chop the bean thread into small pieces. 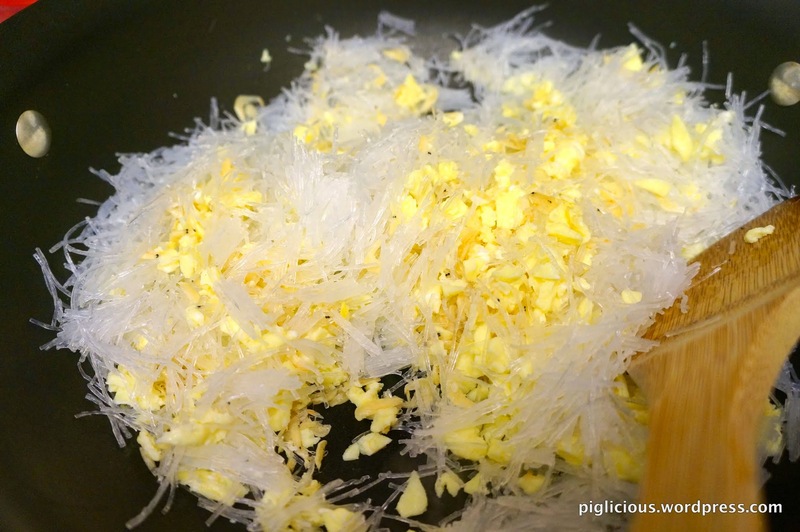 In a medium sized bowl, scramble the eggs with a dash of salt. With the pan temperature on high, place about 1/2 tablespoon of oil. When the oil is fairly hot, place the eggs in and pan fry it. 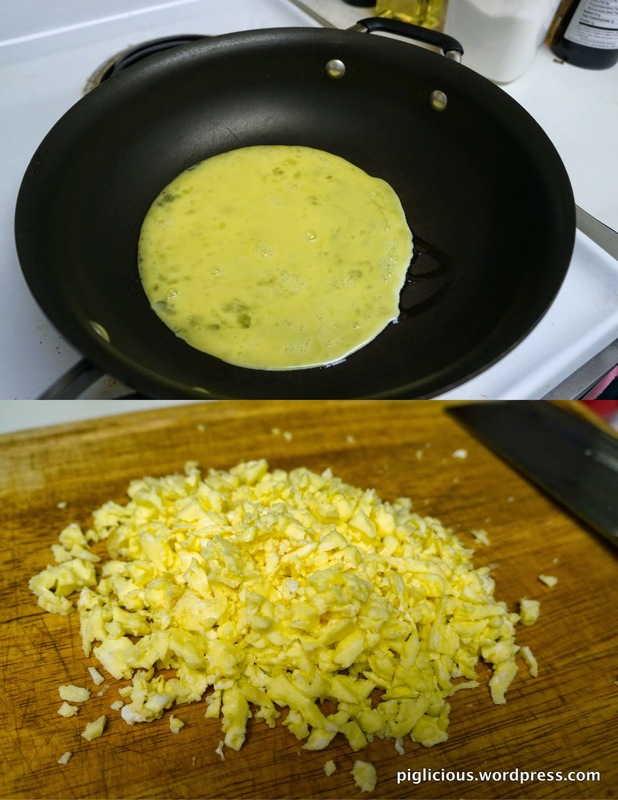 Do not overcook the eggs–once it is no longer runny, try to chop it into smaller pieces in the pan. Then take it out of the pan and chop into even smaller pieces. Wipe off the pan, and turn the temperature back to high. Put about 1 teaspoon of oil in the pan. When the oil is hotter, place the dried baby shrimp in, stir. Place the chopped eggs back in, stir. Place the chopped bean thread in, stir, and add the chicken broth. Stir for about 30 secs. Turn the temperature off. 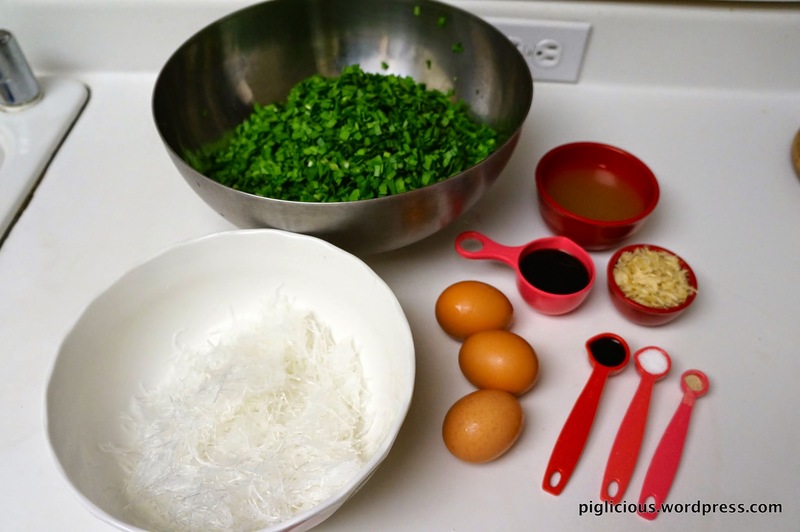 Take the baby shrimp-eggs-bean thread mix and add it to the chives. Mix thoroughly. Add the salt, soy sauce, fish sauce, and white pepper. Mix thoroughly. 3) Make the skin. Now that the dough has had some time to settle, take it out of the bowl and knead very thoroughly with some flour. Then split them into 5 parts. Place 4 of the mounds back in the bowl and cover it with the same wet paper towel (may require re-wetting). 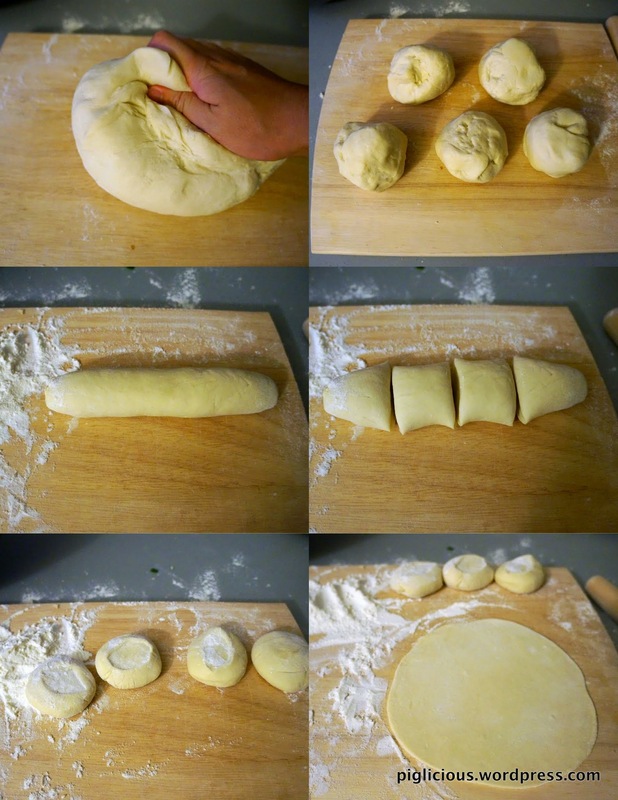 Take the one mound left out and roll it with your hands into a circular long shape, like a sausage. Cut it into 4 pieces. Flour the pieces and with the cross section facing up, smash them down with the palm of your hand. Roll out the smashed pieces to about 2-3 mm thick. 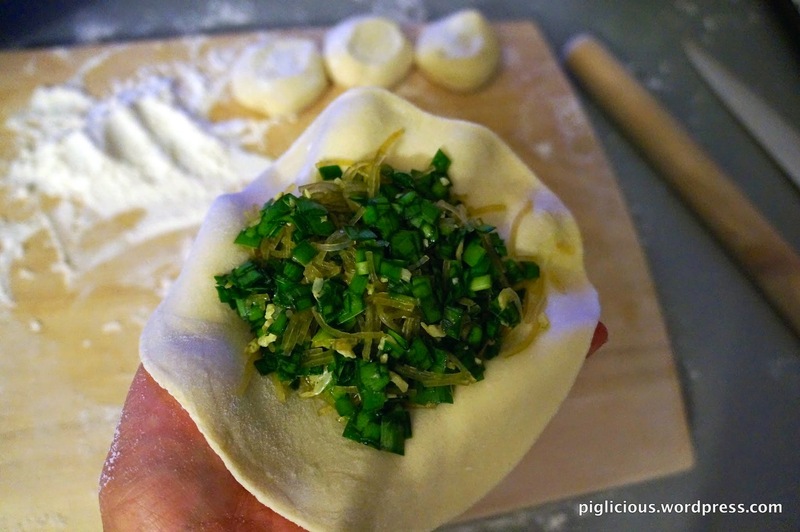 4) Wrap the chive box. Place some filling in the skin and fold the skin in half to enclose the filling. The skin should meet the other half on all edges, about 1cm from the edge. Pleat to seal the edges. Flour the bottom and set aside. (I like to thinly coat a cookie sheet and place the finished chive boxes on there for temporary storage). Repeat 3) and 4) with each of the mounds. Since this recipe may yield more chive boxes than needed for a meal, you could freeze them to enjoy later. Just simply place the cookie sheet filled with chive boxes in the freezer. It will take about an hour to freeze and once frozen, transfer to ziplock freezer bags. 5) *Pan fry. Turn temperature to high. Once pan is hot, add 1 1/2 tablespoons of oil. Place 2 chive boxes, top side down first, in the pan and fry until light brown, about 2 to 3 minutes. Then flip them to the other side (bottom side) and pan fry it for another 2 to 3 minutes or until light brown. 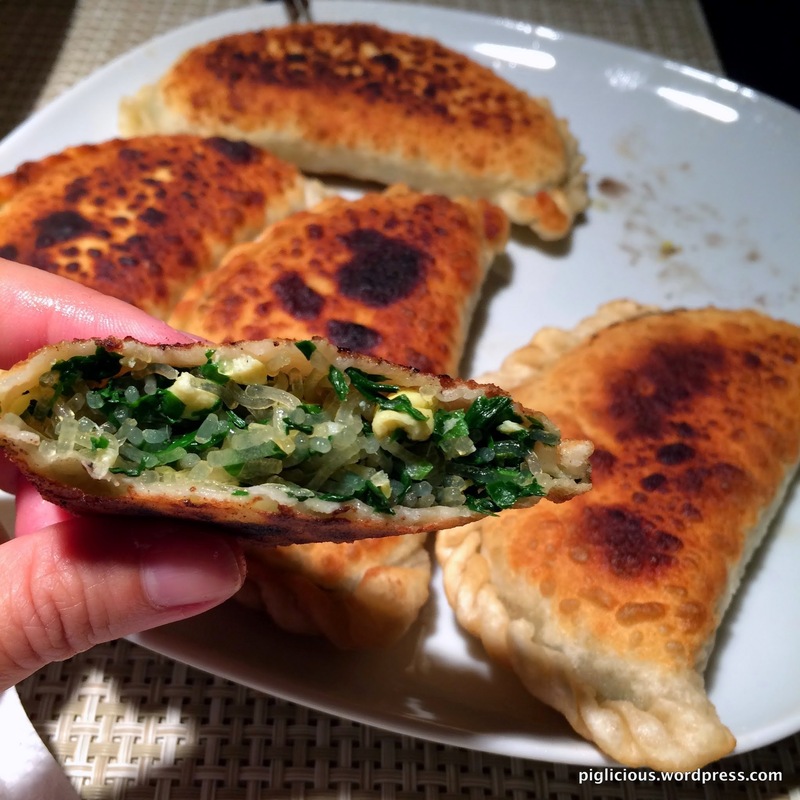 *For chive boxes from the freezer, you could fry/steam the potstickers. Turn temperature to high. Once pan is hot, add 1 1/2 tablespoons of oil. Place 2 chive boxes, top side down first, in the pan and let it sizzle for 1 minute, or until golden. Flip them to the other side (bottom side) and let it sizzle for 30 seconds. Add about 1/2 cup water, or just covering half of the chive boxes. Put the pan cover on to the side of the pan to let the air escape a little. Once the water in the pan fully evaporates, flip them back over to the initial side and fry until crisp and light brown.